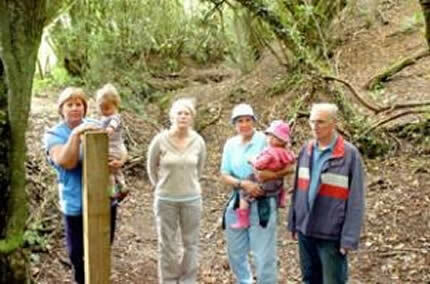 Attempts to put a fence across a trail on common land has caused a dispute in Wickwar. Local representatives and members of the public turned out to obstruct workers from South Gloucestershire Council from putting a fence and kissing gate across Plumbers Trench, at Sturt Bridge, between Wickwar and Hawkesbury. The workers were stopped from carrying out the work and left the site. Martin Summers, chairman of Wickwar Parish Council, said: "I do not know if they had the legal right to try to put the gate there or not, all I am saying is we should have been consulted and we need all the facts." Cllr Summers said he was keen to ensure the correct laws were taken into consideration and that the views of the parish were also noted. "The gate would make it extremely awkward for horse riders and I am sure they would not be happy about that," he added. The track is currently used by walkers and horse riders, although it is not a bridleway. It is common land, owned privately, but managed by South Gloucestershire Council under the Scheme of Delegation. David Morrison, community spaces manager at South Gloucestershire Council, said it was his duty to make a decision quickly after being presented with evidence that soil was eroding away and the land needed protecting. "I made a decision very quickly to put a fence around it, that is what I must do under the scheme of delegation," he said. However, since the residents obstructed the installation of the fence Mr Morrison said he would not be pursuing the measure. "The soil is eroding away very quickly in the trench, I felt at the time something should be done to protect it," said Mr Morrison. "However, now so much time has elapsed I cannot continue to pursue that route." He has advised parishioners that if they want to use the trench as a bridleway they should apply for a Definitive Map Modification Order, under which, if accepted, the trail could become a registered bridleway.